The winter months are a great time to hike along the Waianae Coast to Kaena Point — the western-most tip of O’ahu — to see the creatures that live along the largest stretch of undeveloped coastline on the island. I started the 4-mile round trip hike from the Waianae-side of Kaena Point — from Keawaula Beach, better known today as Yokohama Bay — on the dirt road where Oahu Rail and Land (OR&L) train tracks once extended to Kahuku. These train tracks were destroyed by a 55-foot tsunami that struck the Hawaiian Islands in 1946. But rather than to hike on the road — which is much faster and easier to do — I like to drop down onto the rugged limestone shelf to explore the coves, tide pools, and other features along the ocean edge that are far more interesting to see. One of the first features along the shelf — which is a popular spot for fishermen to catch ulua, moi, and other fishes — is a small cove known as “Moi Hole” that has a sea cave carved into the back of the cove. Not far from the “Moi Hole” cove is an amazing tide pool. This pool is about 10 feet in diameter and has been carved into the limestone shelf by large black basaltic rocks in the pool. Each pounding wave grinds the basaltic rocks against the softer limestone and enlarges the pool ever so slightly. One of the more interesting creatures that live on the limestone shelf are pupu — shells (sea snails). 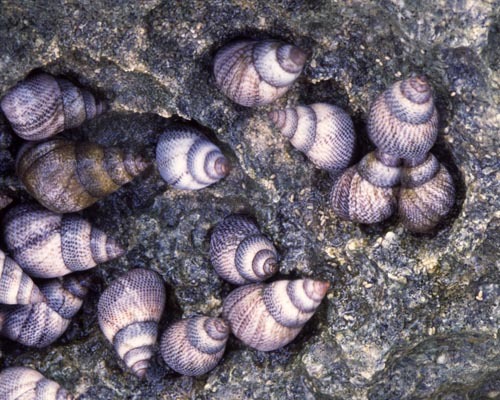 These periwinkles (Littoria pintado) are widely distributed throughout the Indo-Pacific. They live above the water line and can survive out of water for long periods of time. Known as akolea in Hawaiian these shells are about a quarter inch long and can be found over 50 feet away from the edge of the ocean. 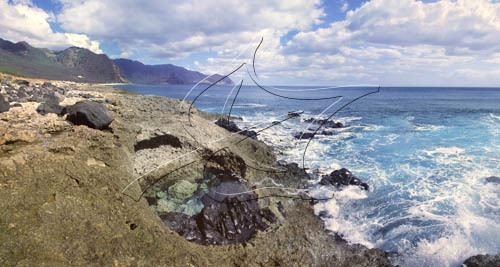 The rugged Waianae coast harbors innumerable rocky tide pools that are home to many sea creatures. If you look closely you can see ha’uke’uke kaupali or shingle urchins living on the algae covered rocks on the edge of this tide pool. 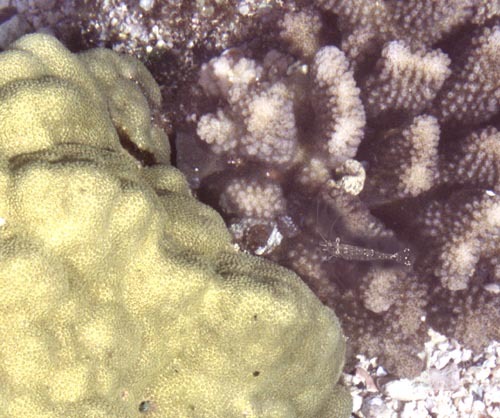 Small opae (Hawaiian glass shrimp or Leptochela hawaiiensis ) make their home among pohaku puna (lobe coral or Porites lobata) and ko’a (cauliflower coral or Pocillopora meandrina) in these shallow pools. Much of the coastline is a jumble of large boulders and rocks which create a series of interconnected tide pools teeming with life. 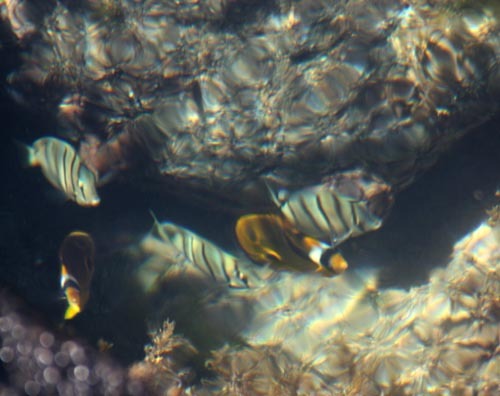 The pools are home to small fishes, like these yellow kikakapu (Racoon Butterflyfish or Chaetodon lunula) and stripped manini (Convict Tang or Acanthurus triostegus). 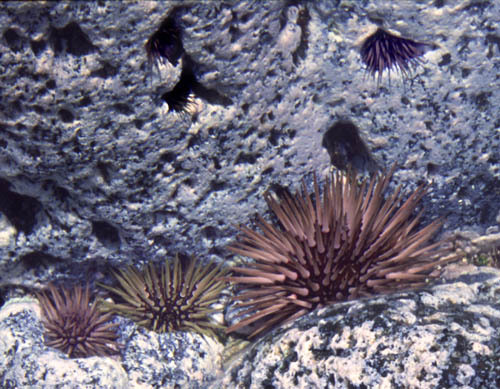 One of the more amazing creatures on the coastline are ‘ina or rock boring urchins. As their name implies, they have the astonishing ability to bore holes into solid rock. ‘Ina are no more than 2-1/2 inches across and are the most common sea urchins in Hawaii. 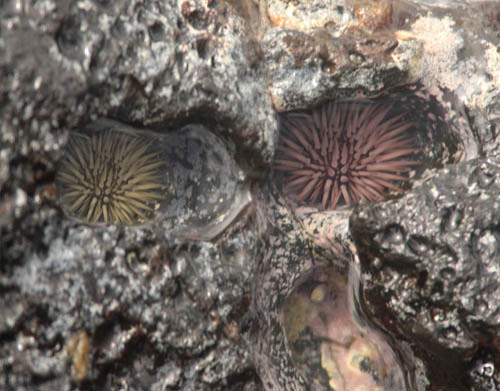 There are two species of rock boring urchins: (1) ‘ina’ula (Echinometra mathaei) which ranges in color from reddish-brown to tan to greenish-gray, and (2) ‘ina’ele’ele (Echinometra oblonga) which is black in color and slighty oval in shape. ‘Ina feed on seaweed film that grows on the surface of rocks. Each time they feed on the algae, their “teeth” scrapes a little bit of the rock off. The abrasive action of thousands of passess over the surface creates depressions in the rock which are enlarged into holes and channels in the rock over the passage of time. ‘Ina are amazing in that they often create living chambers for themselves. They enter holes in the rock when they are small and hollow-out a chamber in the rock as they grow. Some times the urchins grow larger than the opening of the hole and are unable to leave ever again. 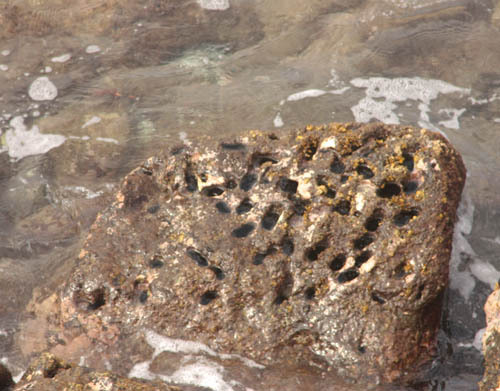 Ha’uke’ule ‘ula’ula or slate pencil sea urchins (Heterocentrotus mammillatus) are common in these tide pools. 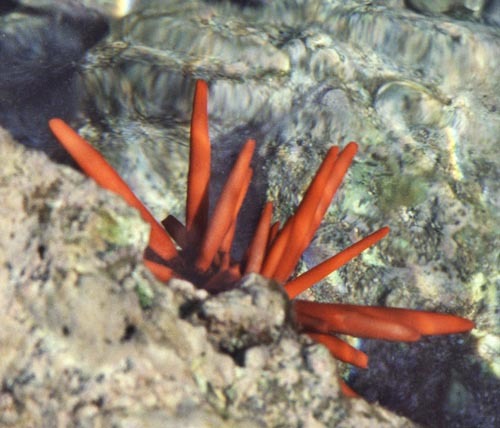 These bright red urchins can grow up to 10 inches in diameter and use their spines to wedge themselves against the rocks. 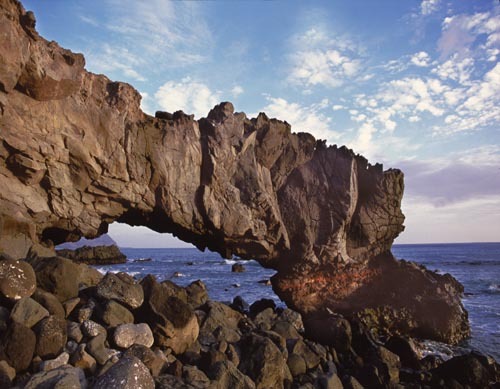 One of the highlights along the coast is a natural arch that spans a hole about 5 feet high and 15 feet long which is always fun to pass through. Not only is it enjoyable to walk through the hole, but the formation is not far from the Natural Area Reserve and passing the arch means the reserve is close at hand. 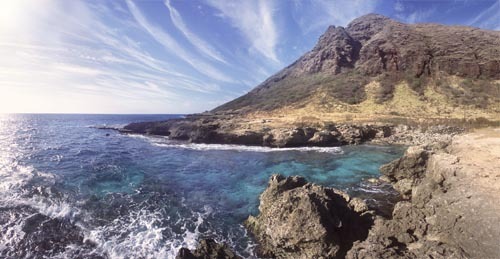 This is the first post in a three-part series about Kaena Point. Stay tuned for the next installment about the migratory and year-round wildlife within the Natural Area Reserve at Kaena Point. 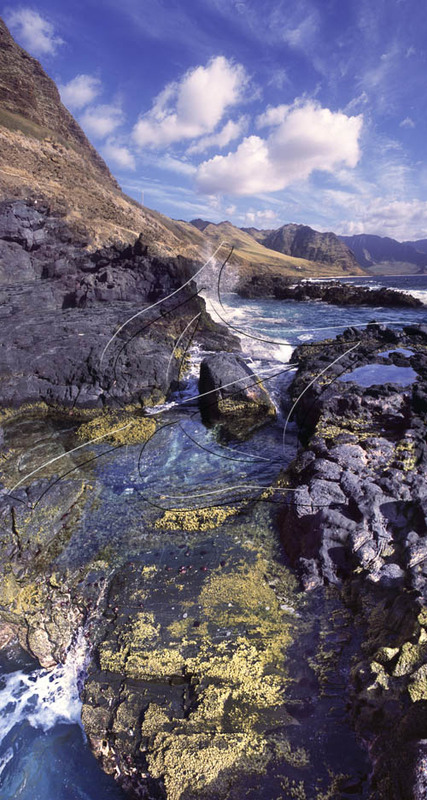 Great write up and pictures of the amazing sea life in Hawaii’s tidal pools! Inspires me to go exploring as well. Thanks… I love the tide pools at Kaena Point. There is always something interesting to see. What beautiful photos! I would like to refer you to marine life books by John Hoover. He has a couple on Hawaiian fishes (a new one is just out with yellow tangs cleaning a turtle on the front) and an excellent one on marine invertebrates (Hawai’i’s Sea Creatures).